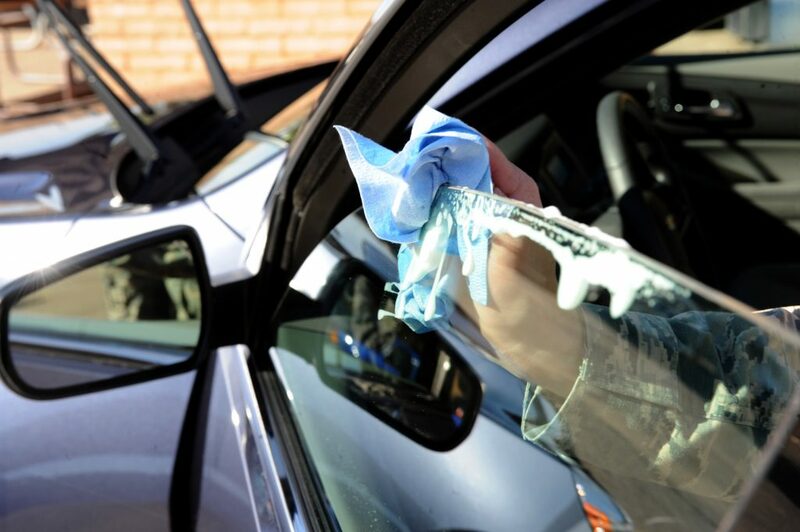 Cleaning your car windows properly requires a proper auto glass cleaner because the standard car wash soap will not be able to remove tough dirt or grime. These car glass cleaners come as a spray, aerosol or even a liquid gel. The best auto glass window cleaner is the Meguiar’s G8224 Perfect Clarity, which is a professional grade formula that provides superior cleaning and a streak free finish. 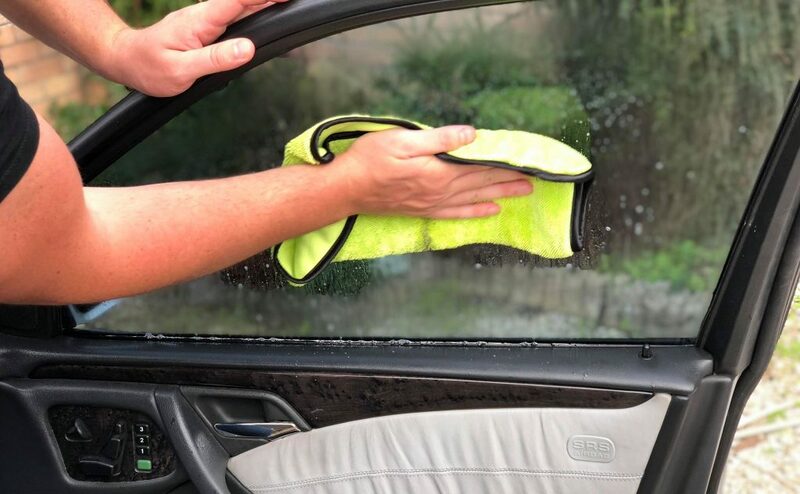 Cleaning your car windows can be easier in some cars than others and without the correct cleaner, it is made even harder. From achieving a streak free finish to removing all dirt from the window, there are many products up for the job. When using a car window cleaner, we highly advise that the formula contains no ammonia or alcohol. This will ensure it is safe on all car windows as stronger solutions can damage tinted windows and perish window rubber and sealants. The outside facing glass may contain tougher dirt that the auto glass cleaner may not be able to remove. If this is the case, we recommend that you use a clay bar kit to capture the dirt. Then you will have a smooth glass surface to spray the cleaner onto. Clean car windows improve your vision and make the appearance of both the exterior and interior of the car look much more attractive. Below is a list of the best auto glass cleaner that will provide a clean, streak free finish with a pleasant smell. Meguiar’s are the market leading brand in the detailing world where they produce one of the best detailing products in every aspect of the car washing world. The G8224 Perfect Clarity is one of the best car glass cleaners for the money. This auto glass cleaner itself is hugely popular across the US for its strong cleaning properties that can cut through the toughest of dirt in seconds. The Meguiar’s car window cleaner provides long lasting clarity and prevents the hazing with the heating or air con turned on. Overall, it provides excellent value for money and definitely a detailing product to have close by when cleaning your car. Adam’s is a premium detailing brand with a strong following by professional detailers. Their car window cleaner is available in different bottle sizes and is eco friendly with no ammonia or alcohol in the formula, which means its safe on all windows. Overall, it is the best auto glass cleaner but you will be paying more than the Meguiar’s alternative. They have a similar formula and spray bottle but if you are willing to pay the extra for the Adam’s Polish then this will not disappoint. Another premium brand dominating the car window cleaning market are Chemical Guys with their product. On the bottle, it clearly states that it is ammonia free and safe to use on tinted car window glass which is a good start. From my own personal use of the product, I was quite impressed with the streak free finish with very little effort on my behalf. Simply spray the cleaner on one microfiber towel, wipe into the window and wipe off with another microfiber towel. Unlike the Meguiar’s product, you should not be using this glass cleaner in direct sunlight as there may be a slight chance of smudges or streaks. Overall, the chemical guys glass cleaner is a great alternative to the Meguiars cleaner where both of very similar prices. If you have used cheaper glass cleaners, you will notice how they cannot remove water spots. The toughest water spots of car windows are developed from a buildup of calcium and minerals. If you have tried the above glass cleaners with no luck, you will require the strongest but safest car glass cleaner. The Driven Extreme car glass cleaner has the strongest formula on the market and is highly popular across the US. The combination of acid gel and abrasives for cutting gives this cleaner the power to remove the toughest of weathered car glass. Other tough dirt can find itself on a car window glass, such as Heavy Lime Scale, Salt Spray Deposit, Rust Deposit, Alkali, Mold & Mildew and Paint Over-spray. Using the Driven Heavy Duty Glass Cleaner, you will be able to safely remove these defects. 3M are a large detailing brand that keep a low profile in terms of their marketing. Their glass cleaner is for those looking for a low cost and simple glass cleaning solution. Interestingly, 3M claim that this cleaner can also be used on automotive vinyl and plastics to remove dirt. As opposed to the other cleaners in this article, the 3M is aerosol based with a no drip foaming action. This type of application is perfect for ensuring a streak free finish and cutting through tough dirt on the windows. The 3M 08888 Glass Cleaner is very safe to apply and do not be worried about the aerosol spray going everywhere. Its safe on the cars paintwork, plastics and vinyl. When using the spray, you will want to ensure that you shake before, apply small amounts at a time and wipe dry immediately. Overall, the 3M product is one of the best cheap glass cleaners for the money but the others are probably worth the small amount extra for a better finish. The Invisible Glass Cleaner is a highly popular cleaner for both automotive and domestic use. This particular product is the improved “Premium” version that provides additional additives for automotive use. The powerful glass cleaner claims no streaks, no hazing and no residue left after application. In a nutshell, this is everything the best car window cleaner should do. The Invisible Glass car window cleaner is safe to use on tinted window and contains no traces of ammonia. This will ensure a safe way to clean all car windows without any strong soap, scents or dyes that can be an issue. Even though it often seems impossible to get your auto glass perfectly clean and clear, it can be done if you follow the right tips and guidelines. Not only does the clean glass help you see clearly, it also gives you the ability to drive better without the frustration of seeing through streaks and dirt. Many people will be happy with the finish of their windows after using a car wash soap. but you will see streaks and dirt present on the glass. We highly recommend a quality auto glass cleaner and below is a detailed guide of factors that you should consider before purchasing any glass cleaner. Many glass cleaners contain ammonia and alcohol in the formula, and even though this is great for cutting through any tough grease build up, there are also several different disadvantages. When you look at ammonia chemically, it is used for rubber, plastic, leather, and vinyl to help dry them out. If you have car window tint in your vehicle, then you will need to purchase a cleaner that is ammonia-free. You cannot use ammonia on tinted windows. The plastics will also lose their blackness and start to become dull. Although it can be revived via a car plastic restorer, you still do not want to cause this sort of damage on purpose. Ammonia is dangerous if it is inhaled, therefore, being inside of your vehicle, in such a small space, you can end up endangering yourself when using this type of cleaning agent. Household cleaners contain ammonia, so try to avoid using any type of household cleaner for your vehicle windows. There are so many individuals who would prefer to use water to clean their windows, and even though it is a safe method, it is not considered the best method. Water does not have the ability to clean deeply to remove any bug remains, or even any tough spots that you are trying to remove. The best thing to do if you are only using water is to use a microfiber car drying towel to help and remove the difficult spots. When you are finished cleaning, make sure to turn the towel over to dry the window. This will prevent any streaks from forming, and give you a clear view through your windows. After you have applied the cleaner to your windows, it is prudent that you wipe the cleaner off promptly. This helps to reduce the build up of residue from the cleaner, and leave the windows clean with a streak free finish. For perfect visibility from your car windows, is important that the auto glass cleaner is formulated to cut through grime and is an anti-hazing formula. Poor quality glass cleaners and car wash soap includes soap and other surfactants that cause the hazing/cloudiness on the windows. Using any of the recommendations will remove the hazing easily for perfect clarity. Cleaning your car windows is a difficult process without the correct product. When it comes time for you to clean your vehicle windows, there are a few tips that you can remember to help you accomplish this task, without having to deal with frustrating streaks afterwards while you are driving your car. Clean inside of your windshield while you are sitting in the passenger seat of your car. This will prevent steering wheel from getting in your way. Keep your windows out of direct sunlight. When you are cleaning them in the sun, the heat from the sun will dry the cleaning agent on your windows. Ensure you are using a high quality drying towel for cleaning the window. Place the towel on the back of your hand, and use the back of your hand to clean the window. It will give you the right kind of pressure to clean the window, and it will help you to reach the corners of the window as well. When you are cleaning the inside of your window, spray the microfiber towel first as this will prevent any type of over-spraying on the window. It also prevents any excess spray from getting on the dashboard of your vehicle as well. Take your time cleaning. If you rush through, it is more than likely that you will end up leaving a mess of streaks while you are working too quickly. Make sure to roll the windows down, so you can clean the tops of the windows. If you use a traditional household cleaner, these have ammonia in them that can damage the lining that is on the glass. It is important to use a cleaning agent that was specifically designed for automotive glass. Its important that you take great care using a car window cleaner on glass because it will scratch, Just like the paintwork, if you use a rough applicator or use an incorrect technique, you will cause scratching. Simply spray the auto glass cleaner and wipe clear, its as simple as that. If you do notice that the car window is full of scratches, you can use a car glass polish on the windows to remove the fine scratches. There are so many different types of auto glass cleaners that can be found on the market, and they are all specifically designed to be able to take care of the dirt, grime, and bug remains that have built up over time. All of our recommendations will do a perfect job of improving clarity of your car windows and are available in several types to suit your personal preference of application.